PHOENIX - As the echoes from the final volley of the firing party quiet, the bugler wets his lips one last time before exhaling into his horn. The familiar sound of taps plays out across this hallowed ground, signaling the arrival of a hero to their final resting place. Members of the Arizona National Guard’s Honor Guard meticulously fold the stars and stripes into the shape of a tri-cornered hat, emblematic of the hats worn by colonial soldiers during the war for Independence. In the folding, the red and white stripes are finally wrapped into the blue field of stars, as if disappearing into the darkness of night. As the flag is passed into the hands of the surviving family members, tearful eyes watch as the final salute is rendered. For the Arizona Honor Guard, this ceremony holds no less importance than the other 16,000-plus they have performed since Jan. 1, 2000, when the National Defense Authorization Act mandated that the United States armed forces provide the rendering of honors in a military funeral for any eligible veteran, if requested by his or her family. Army Staff Sgt. Christopher Potucek is the noncommissioned officer in charge of the Arizona National Guard’s 20-member Honor Guard detail and has been a member of the team since 2009. To keep up with the tempo of requests, the Arizona National Guard maintains 10 full-time team members and 10 part-time members, which rotate responsibilities. Members make up three teams. One team performs all services at the National Memorial Cemetery of Arizona. The second team performs services at the outlying local cemeteries throughout the state. The third team conducts day-to-day operations and trains on funeral service specifics. These teams rotate weekly to maintain the sharpest performances possible. “We provide this service for the families, to pay respect for their sacrifice and to ensure that the service members receive the final respects they are entitled,” said Potucek. Applications for membership to the Honor Guard are almost as high as its demands. Each year, members from all across the Arizona Army National Guard are submitted for review to be accepted onto one of the teams. Each application is carefully reviewed, and the demands of the position are explained in detail. For Honor Guard members, training begins with a 40-hour introduction and evaluation course. During this course, prospective members are provided classroom and hands-on instruction on drill and ceremony, flag folding and funeral detail specifics. An end of course test is given and overall performance is weighed before an invitation to join the Honor Guard is extended. 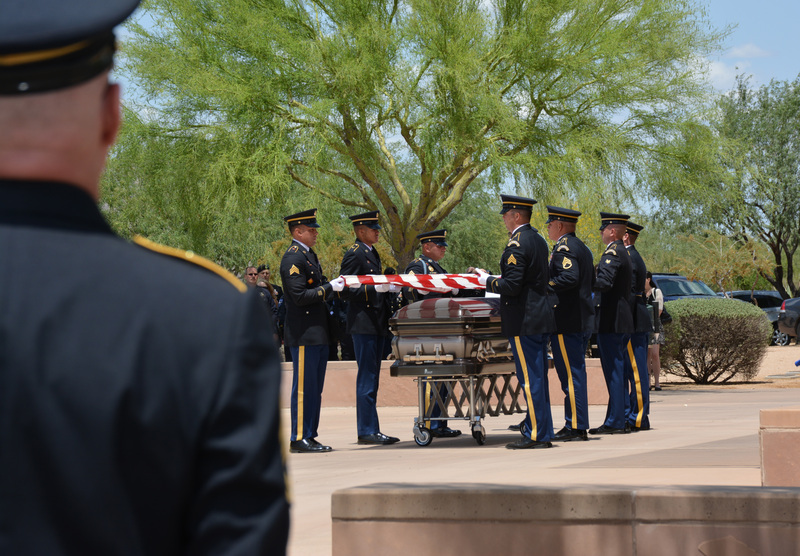 For the service member who has passed and the family left behind, this last humble act by the Arizona National Guard’s Honor Guard is the final act of gratitude from a nation built on the selfless service and sacrifices of our men and women the United States armed forces. As mandated by federal law, an honor guard detail for the burial of an eligible veteran shall consist of no less than two members of the armed forces. One member of the detail shall be a representative of the parent armed service of the deceased veteran. The honor guard detail will, at a minimum, perform a ceremony that includes the folding and presenting of the flag of the United States to the next of kin and the playing of Taps. The National Guard identifies four regions for Honor Guard responsibilities. Arizona is in the southwest region, which includes New Mexico, Colorado, Utah, Texas, Arkansas, Kansas, Louisiana, Missouri and Hawaii. Historically, Arizona’s Honor Guard has been one of the busiest in the region, keeping on pace with Texas, which according to the United States Census Bureau has a population of just over 19 million more people than Arizona. If you would like more information about military funeral honors, contact the Fort Huachuca Casualty Assistance Center (CAC) at 1-800-248-0759 or your local funeral director's office, or visit https://www.dmdc.osd.mil/mfh/.